Conceptually, the Grumman OV-1 Mohawk was designed as a multipurpose aircraft; however, the brief combat experience of the experimental JOV-1A version demonstrated that the Mohawk had much more potential as a surveillance and reconnaissance plane. One of its prototypes was equipped with Side Looking Airborne Radar (SLAR) fitted in an 18-foot long box-shaped pod mounted under the front fuselage and offset to the right. Just like the OV- 1A, the OV-1B also carried optical cameras. The new type was named the OV-1B and it differed considerably from the OV-1A. Wingspan was stretched by 1.97 meters (5 feet 10 inches) to improve climb rate, and the armament pylons and airbrakes were deleted to reduce weight. Along with all these changes, the previous dual control cockpit was superseded by a new crew arrangement of pilot and SLAR operator. The innovative SLAR designed and produced by Motorola provided reconnaissance imaging capability in day or night in any weather and could work automatically. The SLAR also had a Moving Target Indicator capability to highlight moving vehicles in imaging using an APN-129 Doppler system. 101 OV-1B were produced and they operated all over Vietnam. Some units were equipped with both the OV-1A and the OV-1B. They were intensively used in 1965 in Operation Tiger Claw, providing surveillance and air support along the Ho Chi Min Trail. They were also used with the B-52 strategic bomber and the AH-1 Cobra helicopter as a pathfinder. The enemy is said to have referred to the OV-1B as the 'Whispering Death' because of its extremely quiet turboprop engines. 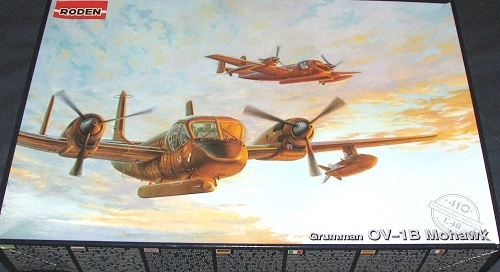 The OV-1B won a reputation of invulnerability so any Vietcong soldier who brought one down was recommended for a high decoration. The Mohawk was also used by civil organizations. SLAR sensors proved particularly useful in geological and geodesic missions. The US Geological Survey bought a few Grumman OV-1B Mohawks and in 1971 performed low altitude geological and hydrological research, and mapping missions over the Alaskan Highlands to study Arctic glaciers and carry out surveys of the Alaskan oil pipeline. Thanks to www.rodenplant.com for that historical background. Difficult to say anything new about this kit as it is basically the exact same boxing as the previous OV-1A with the inclusion of the SLAR pod to do the B version. I've included a small shot of the SLAR pod as it is the only difference aside from the extended wings (I've put comparison images to the right). I've also repeated the info from the earlier preview below so those who have already read it can continue down a few paragraphs. If you have bought any of the Roden kits over the last year or so, then you know that they are well molded and generally go together well if one is a careful constructor. Like Dragon kits, one cannot just toss together a Roden model. You have also noted a steady improvement with each new kit being that much better engineered and more builder-friendly. After opening the rather large box, I started going over the kit with a critical eye. Much to my delight, I found no sink areas, no flash and no problems with ejector pin marks. The clear parts are individually packaged so there is no problem with scratches or stress marks and the parts are commendably transparent and thin. Not all pieces are used in this variant, so you can be sure that there are at least one or two more boxings of this kit to come, including, I'm pretty sure, a modern version with the SLAR pod, as several of the unused clear bits are a more modern instrument panel and several CRT boxes. The cockpit is very well appointed with individual rudder pedals and nicely done 9 piece seats. You have the option to leave off the wing pylons should you desire, but I've rarely seen an OV-1 without them in place. In addition to large fuel tanks, you have what appears to be a gun pod and two different rocket pods to help put something under the wings. 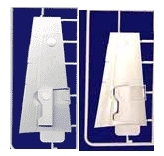 You also have two different noses for the plane, one a more modern one with a landing light in it and molded in clear. Speed brakes can be positioned open or closed as you wish. Wheel wells are nice and deep and well detailed. Instructions are excellent with very clearly done construction drawings and any color information required for the different decal options clearly marked. You can have your OV-1 in any color you want as long as it is OD with black-grey wing walk areas. These wing walk areas will have to be painted in as the decals only provide the black outlines. The black engine anti-glare panels and wing/tail leading edges will have to be painted on as well. I don't recall seeing any indication of nose weight needed but with its short coupled landing gear, it will definitely need all you can supply. One thing that has gone unchanged is that they way the cockpit side windows is hinged is incorrect. They sort of slid down as they opened so the actual hinge line would be about a foot below the top of the opening. Grumman OV-1B Mohawk, s/n 64-14270, 73rd Surveillance Company, Vung Tau, Vietnam 1967. Grumman OV-1B Mohawk, (N171) of the U.S. Department of the Interior, Geological Survey 1971. Grumman OV-1B Mohawk, s/n 59-2673, 131st Surveillance Company, Phu Bai, Vietnam 1967. There are no aftermarket decals for these planes (yet) and I can imagine that we'll see yet another boxing for the OV-1D which will have a few more antennas and grey paint! I've seen this kit built and it is most impressive. Best of all, the price of Roden kits has gone down and at around $25 MSRP at this time, it is a real bargain!